San Francisco is a really amazing place after the sun goes down. The lights come on and the city becomes a different place. Photographically its easy to see the beauty in the city...but actually being able to capture it can be a different story. 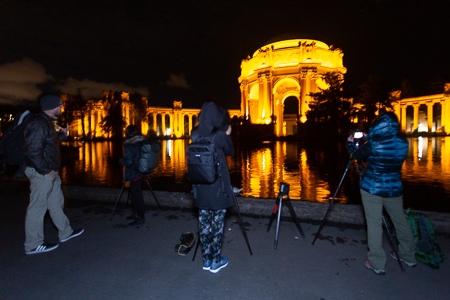 For over 10 years our night owls course has been providing folks with the tools necessary to capture San Francisco’s beauty when the lights come on. 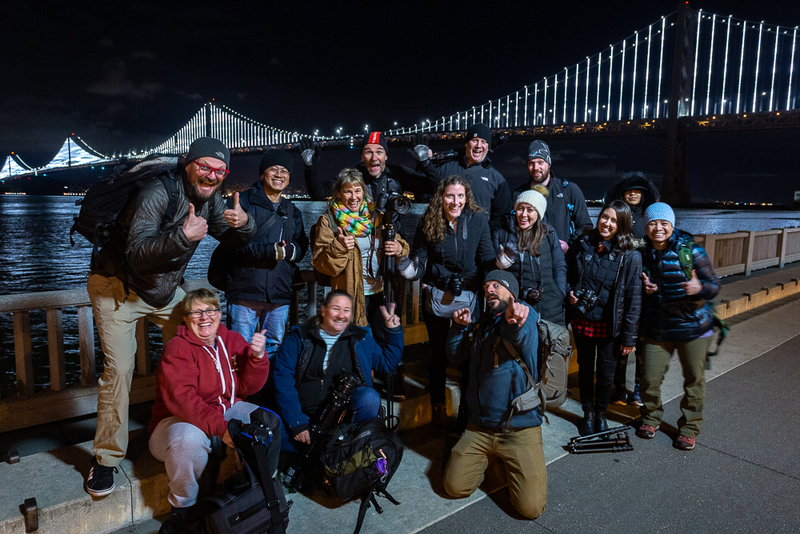 Scott and I met a group of 12 eager photographers for a night of exploration in the city by the bay. 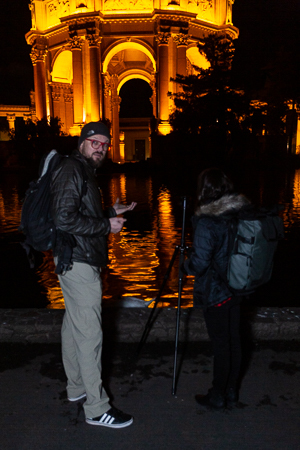 Our first stop for the night was the Palace of Fine Arts. It’s hard to get much better than this in terms of a beautiful first stop. The palace offers up reflections, warm golden light, and a beautiful image. Scott and I help the group to get set up, many folks are fiddling with tripods for the first time and that can be a little frustrating. Once everyone is up an operational, we try to go over the different approaches to shooting this location, and the reasons for shooting the scene this way. 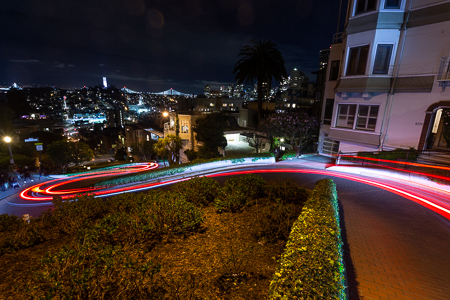 Our next stop for the night is the iconic twists and turns of Lombard Street. 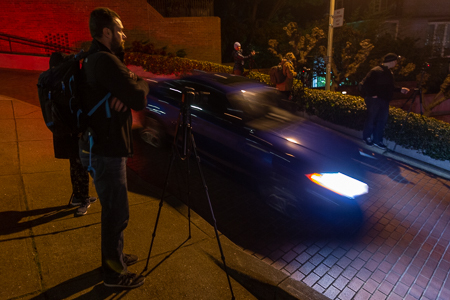 Once on the scene we break up into smaller groups and then take them to shoot the headlights and taillights of vehicles as they slowly make their way through the “crookedest” street in the city. Scott and I use a couple slightly different approaches here that folks can implore to capture moving car lights. Each group gets to shoot some taillights and headlights from a couple different vantage points. These images are the first ones where the group starts to get really excited, because not only are their images coming out great...but they are starting to understand how to shoot as well. Next it’s off to the Embarcadero to shoot the Bay Bridge. This is another extremely iconic location, that most folks have probably seen before online. It’s fun to finally get here, and take your own version of this shot though. The group spreads out and we work with them on dialing in balanced compositions, and just reiterating the settings and starting points. Our final stop for the night is the Fort Baker fishing pier. Here we have a great vantage point of the Golden Gate Bridge. 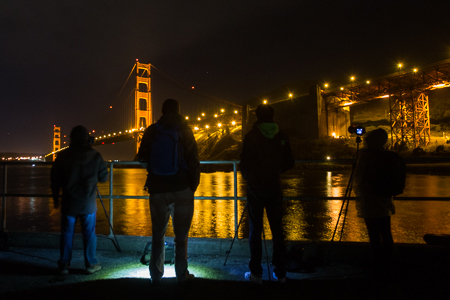 It’s a perfect way for the group to conclude a fun night of exploration and photography in the city. A great swath of clouds has rolled in and the images on the back of the cameras are awesome! Everyone is jazzed to head back and start processing the images...which is a great way for us to end the night!